Like a River Glorious by Rae Carson. Greenwillow, 2016. Paperback. 432 pages. You can find my review for Walk on Earth a Stranger (Book One) here! Western themes are definitely not normally something I'm a big fan of, but I fell in love with Walk on Earth a Stranger, and after finishing it I knew that I would be eagerly awaiting the sequel. I probably needed a little bit of a refresher before starting, but fortunately I wasn't too lost and was soon right back in the swing of things and enjoying myself once again in this world Carson has created. 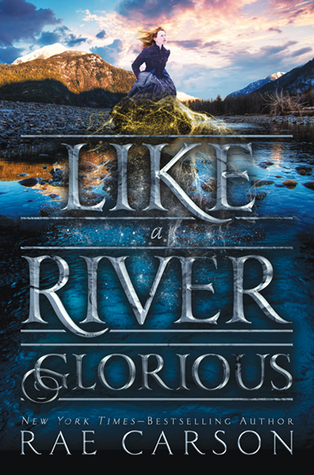 The first book left off as Lee and the rest of the group finally made it to California, and Like a River Glorious picks up right after that. Because of her gift, she has the potential to become a flourishing gold miner, but of course nothing is ever easy when you have an evil uncle that wants to kidnap you and force you to use your powers for him. Lee is just as fiery and strong as she was in Walk on Earth a Stranger, but this time she has a whole new slew of issues to deal with, such as dealing with her Uncle Hiram and her struggle to come to terms with the horrible treatment of the Native Americans that are forced into slavery, which I will touch upon a bit more later. Lee's strong, endearing character is still perfectly intact: she's independent and bold, but she is also aware that she's not perfect and doesn't have a way to fix everyone's problems. I love that Lee is just a really good person as well; she truly cares for others and wants to help them by eradicating their suffering. Along with Lee, Jefferson is pretty high up there as a favorite character. I love his determination in both pursuing Lee and doing what he can to keep everyone safe. His respect for Lee is wonderful, and although he does continue to ask her to marry him, I appreciate that he respects her unsure stance on marriage and her dislike for conventional marriages in which a woman becomes 'property' to men. I also just want to note that the rest of Carson's supporting characters are all just as well-developed and entertaining as Jefferson and Lee, and I sincerely enjoyed watching them all develop and their relationships with one another flourish. I think Carson did well in capturing the horrible treatment of Native Americans. The fact that Jefferson himself is half-Cherokee fits into this really well, as it allows us to see even more perspectives, since Jefferson himself isn't in the same position of those in California who had their land taken away, but is still affected and hurt by these actions all the same. However, I'm hoping that the final book in this trilogy actually spotlights Native American culture and their lies a bit more, as this book mostly kept them in one view - as slaves. This book moved pretty fast, and I feel like not a lot happened in a lot of time. By that, I mean that I feel like the story was stuck in one place for a majority of the time, and I suddenly found myself surprised to be 3/4 of the way done. I'm not sure if the book moved too fast or if it was jsut that easy to get sucked into, but at least we can say it held my attention! The ease in which I read this book was largely due to Carson's flowing, elegant writing. She crafts gorgeous prose that takes her readers for an adventurous ride, something that she has been a master at since her first trilogy, The Girl of Fire and Thorns. Now, I had some questions about Lee's gift that I had hoped this sequel would answer, but unfortunately it didn't answer some of them, such as why Lee has this gift and whether or not she is the only person in the world with a gift like this? However, Like a River Glorious did indeed explore more of Lee's power and showed how strong and powerful it can truly be, which was definitely what I wanted. Carson also explored more of the supporting characters, and though there still could have been a bit more, I think she did a really good job creating a unique array of characters that truly brought life to the story. Overall, I will be giving Like a River Glorious four stars!